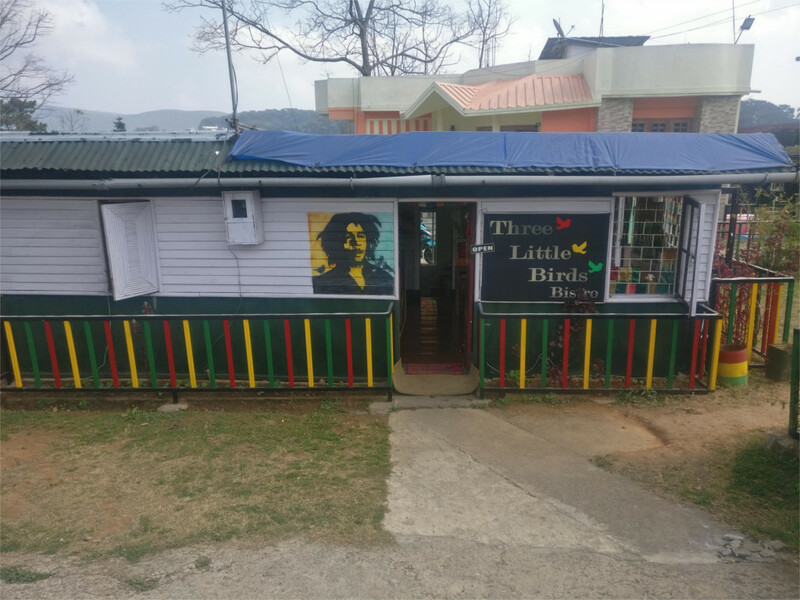 While wandering around the Mawlai Phudmuri area of Shillong, I was complaining bitterly about our inability to find local music venues in town. The winding road was bounded by high walls. There was a gate in one wall and a sign on it said “Three Little Birds Bistro”. 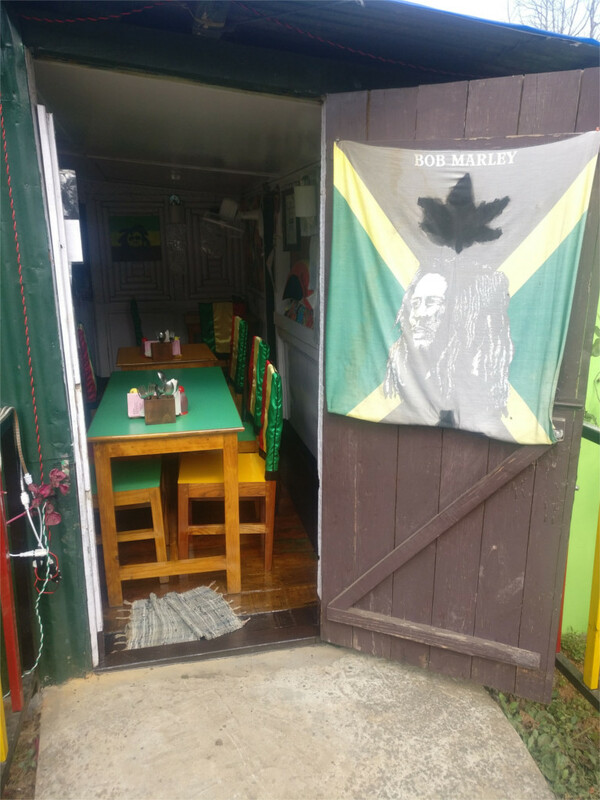 I’m always ready for a coffee, so I stepped through the gate and saw a long low building with a large portrait of Bob Marley painted on it. Could this be what I was looking for? A young girl behind the counter said that I couldn’t get a coffee since lunch service had already started. The bistro part of the shed was quite empty, but through an open window behind the girl I could see another half of the establishment which was indeed full of diners. There was clearly no more conversation to be had. I stepped back out and found that The Family and the nieces had found props for instagram photos of themselves. I was briefly roped into helping them out, but soon I left to walk around the property. There was another door to the bistro and this proclaimed reggae even more forcefully. Just as we were about to leave I decided to go in again and ask about music. There was an older lady at the counter now, and she said “Yes, we play music in the evening.” That was promising. I asked “Live?” She said “No, from the computer.” I smiled a goodbye. This was disappointing again. As I was leaving I saw a shed off to one side. I haven’t seen hay drying inside a town in a long time, so I moved that way to take a photo. There was movement in the hay. As I approached I found a litter of really young pups. They were still unsteady on their legs. The mother looked at me and moved a bit to be able to defend her litter. 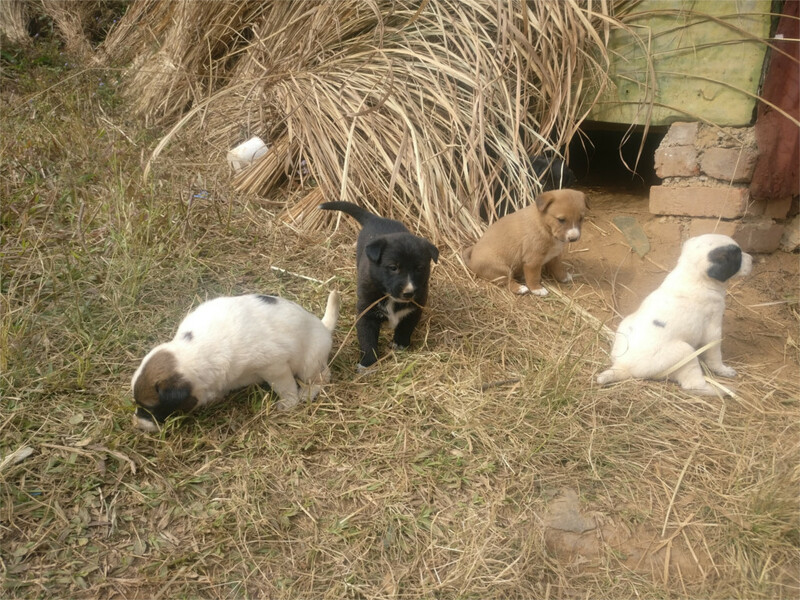 I didn’t touch the pups, although they were adorable and just the age when you want to pick them up. These were no maga dogs. Nor was there any reggae. I left. In Spain we tried to stray off the beaten path whenever we could. This meant that we would often get lost and tired. The hot sun would force us into a small and forgotten bar now and then. These places are either wonderful or terribly dispiriting. The featured photo shows two barflies nursing their drinks in the middle of a hot afternoon. It would seem we had wandered into a bar of lost souls. Not exactly. Outside the bar were a couple of retirees engrossed in books of puzzles. On the metro we had seen a couple of other people equally deeply into puzzles, and wondered what they could be. 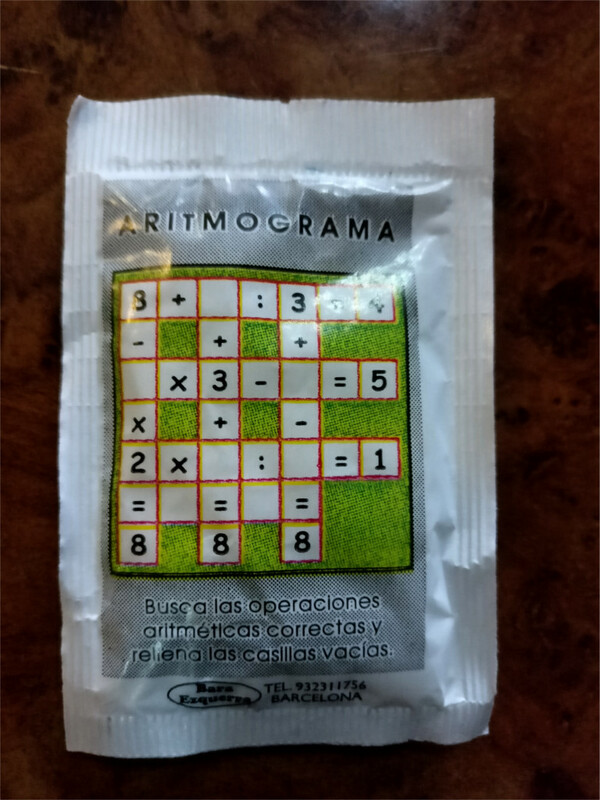 They did not look like Sudoku or crosswords. At the cafe we discovered what they could be. 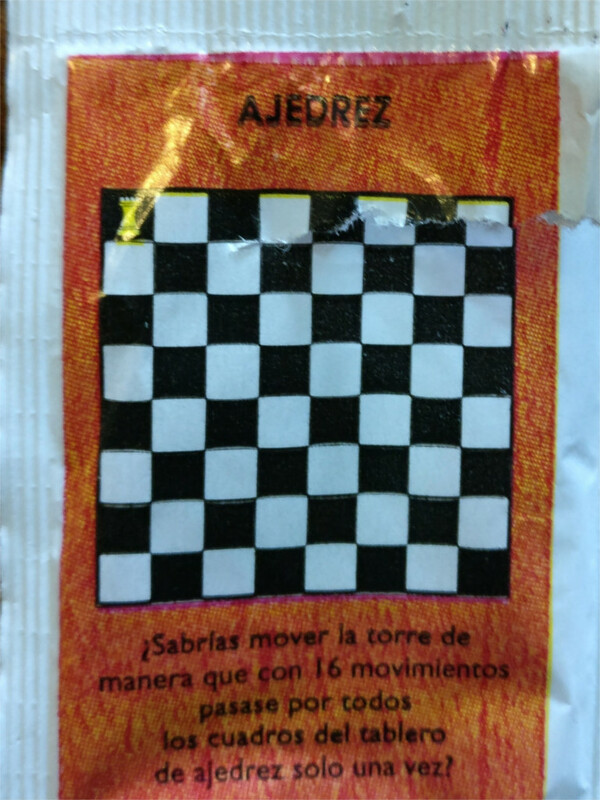 The sachets of sugar we got with our coffee had these two puzzles on them. Presumably the old people we saw were trying to solve bigger versions of these puzzles. I shoulder-surfed one of them as we left. He was solving an intricate word puzzle which was not a crossword. Maybe we could try to buy one of these books and try our hands at them. Walking through an unknown city is always a great way to spend time. How else could I know that in Yangon even street-side eateries give you a pot full of tea with your lunch? How else would I begin to suspect that townies hid their faces when a foreign journalist took their photos; a reflex that persists even after democracy is back? 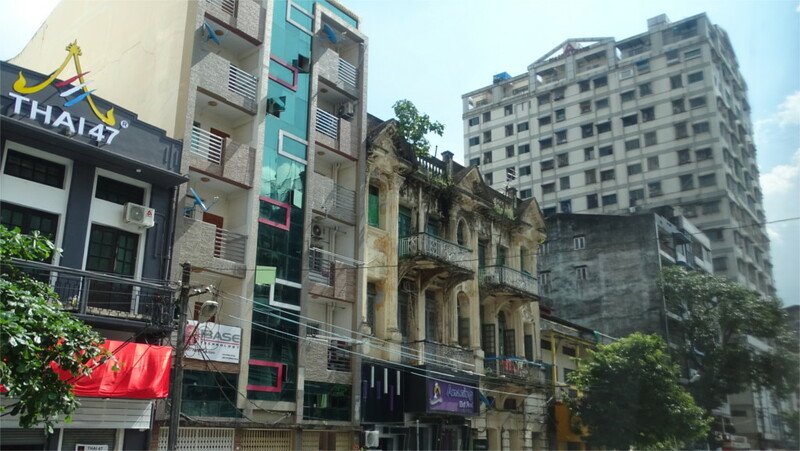 Outside the Colonial centre of Yangon every street is a jumble of architectural styles. Sagging buildings from the first half of last century share a frontage with modern buildings: some are high-rises, others are pre-fab commercial units faced in glass and metal painted concrete. Some of the architecture dates from a few decades ago. 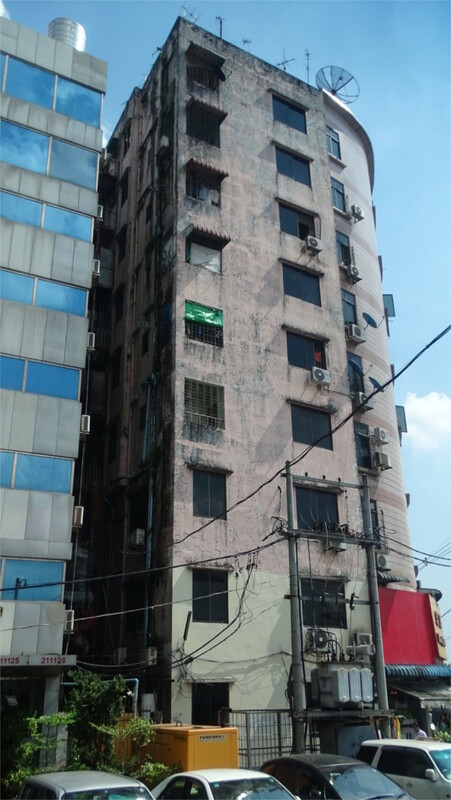 We saw these two high-rises next to each other. One was modern, the other was probably thirty to forty years old, and already ripe for demolition. This gave me one answer to my question about why Yangon was such a small city. Most cities in Asia are huge sprawls. 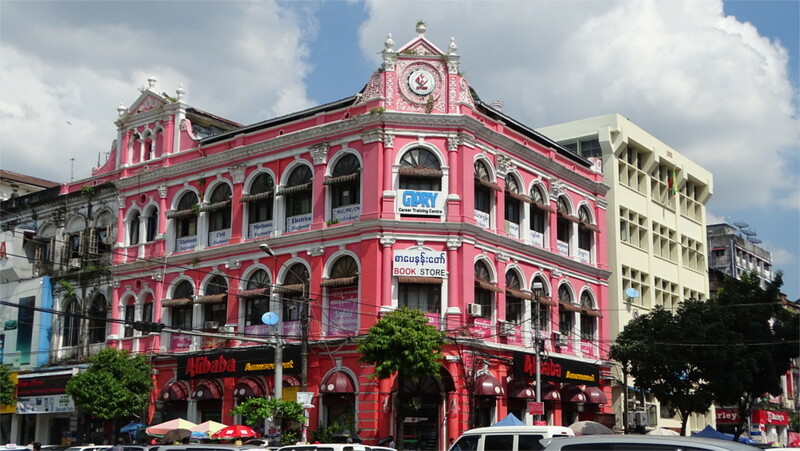 In comparison, Yangon is like a town from the 1960s with the traffic of problems of the 1980s. The answer that this building gives to the question is that construction was costly and shoddy during the lifetime of two generations. Yangon never grew, and now it will probably do this at thrice the rate that the rest of Asia manages. How would it cope? To see that I took a walk through the Colonial centre of the city. By all accounts the centre of the city is Sule square. Strange that the invading British would plan the centre of Yangon around one of the most revered temples in Myanmar, but that is one of the contradictions of Imperial Britain in India and Burma. Right next to the pagoda is the imposing town hall (photo above). The restoration of this building and the ones next to it are done with loving care. This lovely bookstore reminded me of Kolkata. Outside of Kolkata, Mumbai and Yangon I would be hard put to name a town where there is an almost untouched colonial era district. I say almost, because the building just behind this is modern. It is interesting that the central district still has a large bookstore: banks have not yet taken over. 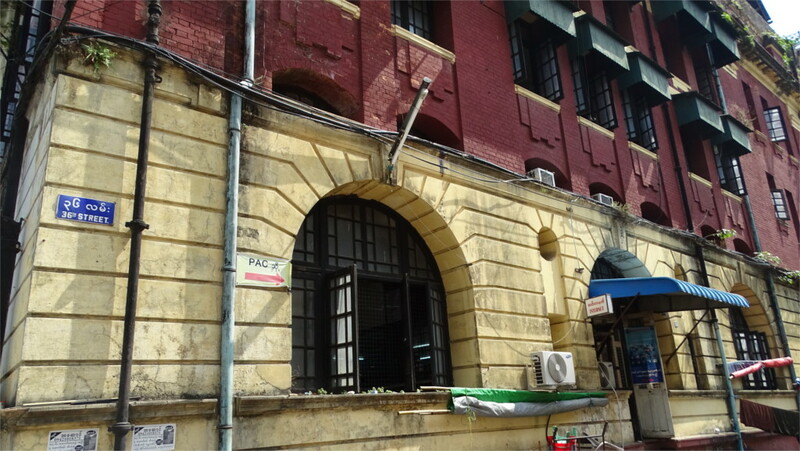 Two blocks down, there was a massive colonial-era building which served as a post-office. It had not yet been restored, but seemed to be in good repair. The colour scheme was no different that what you might see on a similar building in Kolkata. The streets were full of informal commerce, vendors selling food, toys, socks, sun glasses. The sight of a row of pavement stalls selling used books reminded me of Mumbai in the 1980s, when I, and probably a million other people, would buy books mainly from such vendors. That past is now as foreign as Yangon. 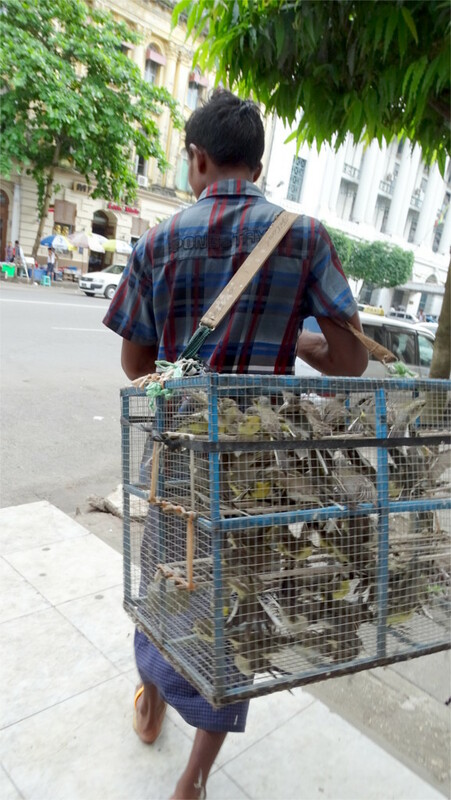 In direct contrast to such familiar sights was a vendor who brushed past me on the road, carrying cages full of birds on his shoulder. I followed him for a few paces. They were not birds which you might want to eat. Nor did it seem likely that several Burmese every day would impulsively buy a couple of birds as pets. It turned out later that this was a wonderfully cultural con. A devout Buddhist would gain merit by buying a few birds and releasing them. The birds are quite tame, so after release it would be easy for this man to catch them again for merit recycling. I guess the net result is that the vendor gains money and loses merit: something he is willing to risk. 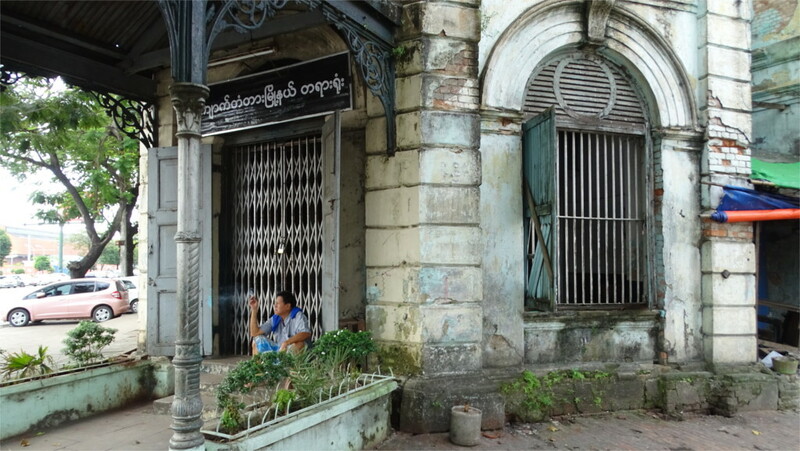 Restoration work had not yet covered all of Yangon. As we approached Strand Road, and the river front, we passed this magnificent but dilapidated building. Some enquiries led to a tiny crumb of information: that it belonged to a famous Jewish merchant from India before independence. It was sold to a local businessman, and was later bought over by a general. The Baghdadi Jews of Mumbai were great merchants in the late nineteenth century, and left their architectural stamp on downtown Mumbai as well as the Bund in Shanghai. None of the names I mentioned made any sense to the people I talked to. 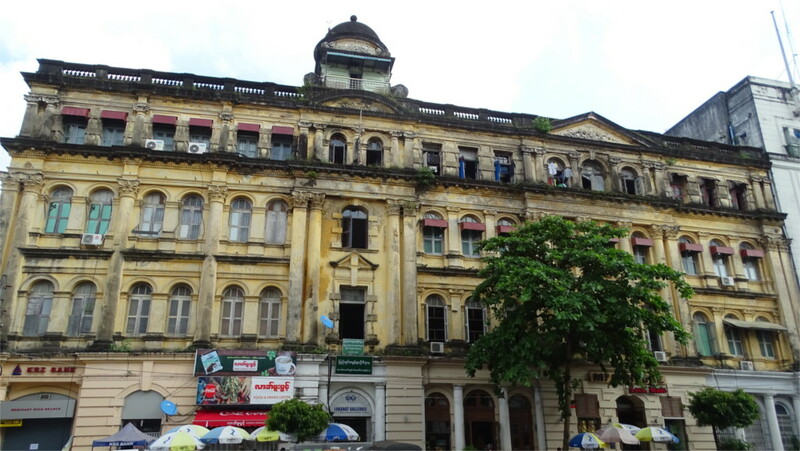 I’m sure the urban history of Yangon is documented well enough that one can trace the history of this building. Right on Strand Road was this vast and crumbling building. The locked doors and the man sitting on the steps smoking reminded me of Kolkata in its worst decades. This was apparently the District Court, locked up for the weekend. I asked why a district court is crumbling away when a post office can be in good repair. There was no real answer to that. 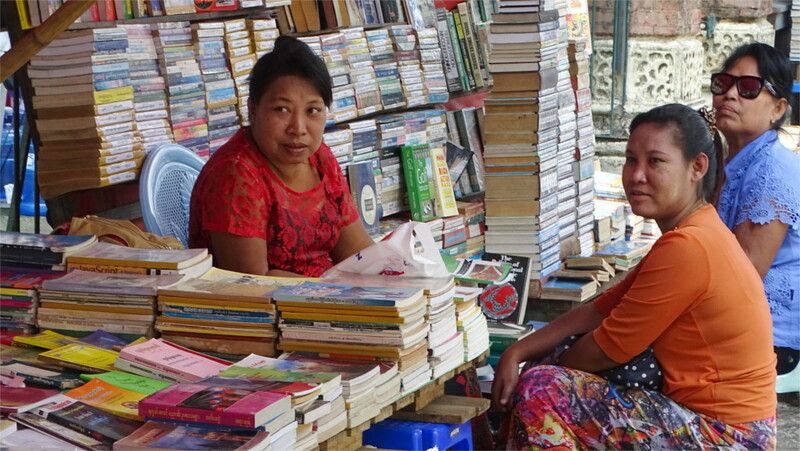 Myanmar lost decades, and it is beginning to catch up. If this district is restored and put to use, it may become a major cultural heritage: the only place on earth where the architectural style of the Raj remains untouched. You can probably tell by the shadows in my photos that it was now well into the lunch hour. The street food scene was buzzing. I discovered a little canteen which seemed to be full. It looked clean, and the inside was full of purposeful bustle: waiters and waitresses went back and forth, and there was a low rumble of conversation between diners. I didn’t go in, but one of the waiters noticed me and posed for the photo you see here. The place looked like a typical inexpensive eatery from my days as a student in Mumbai. Just a little before I’d come to this, I saw a van come to a stop outside a building and two young women get down to unload trays and carry them in. I got a look at one of the trays as it was carried in. It was full of bread. I followed them in, and it turned out to be a cafe. It was busy with customers and uniformed waitresses. I was tempted to sit down there for a quick lunch. 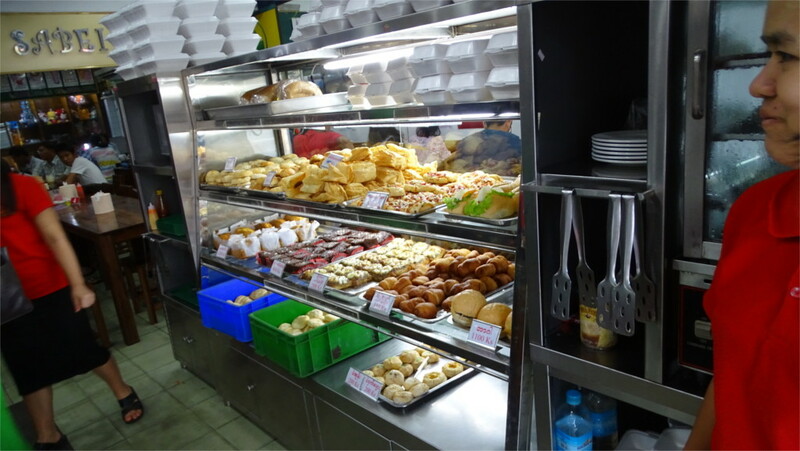 But the previous day I’d had lunch at a similar place, and I was planning to try out a Burmese-Chinese place in an hour. I clicked a few photos and said a reluctant goodbye to the cafe. This had been a successful walk. 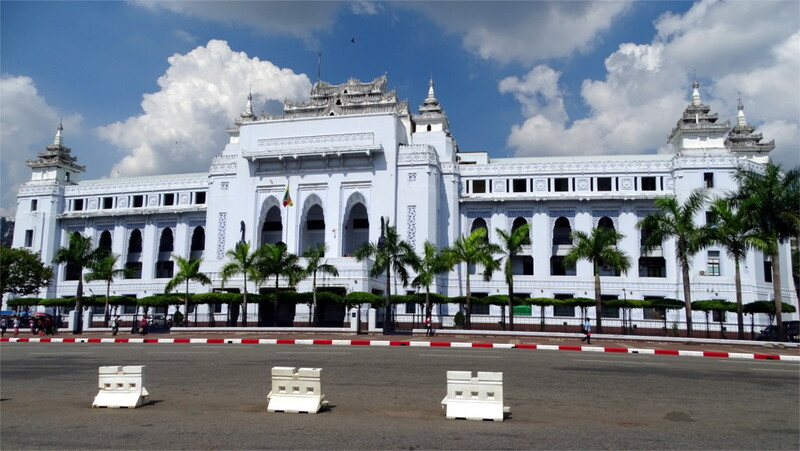 I saw a slice of Yangon which emphasized the common recent history of the countries along the Bay of Bengal, and found out a little about everyday life in the city.